(May 17, 1945) -- 1st Lt. Wilfred Potis, 28, son of Mrs. Charlotte H. Potis of Hornblower Avenue, was killed in England in an aircraft accident on April 26. 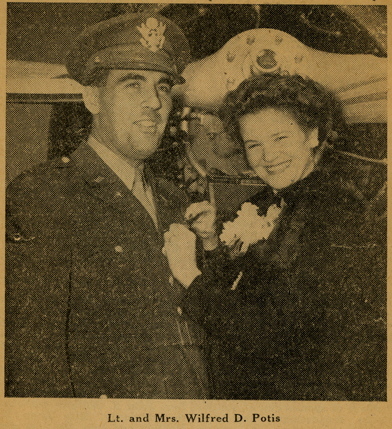 His wife, Dorothy, received the telegram the day after V-E day, when victory was declared in Europe. Lt. Potis was the pilot of a B-24 Liberator, stationed with the Eighth Air Force in England. His last letter was written April 25 after he completed his 34th mission, the finale for the Eighth Air Force. Reports said the Skoda works and Pilsen and rail targets at Birchtesgaden were targets. Potis said in his letter that April 12 he saved his plane and crew from a collision with another plane in formation ... it had stripped a wind in ''peeling off'' and was falling towards him. Potis enlisted March 5, 1941, and was assigned to the infantry division. He was in San Francisco on his way to the Philippines when Pearl Harbor was attacked. He was then sent to Hawaii for 8 months. Potis was sent Officer Candidate School at Ft. Benning, Ga.
After six months as an infantry officer at Camp Claybourne, La., he switched to the Air Corps. He received his wings at Pampa, Texas. According to the American Battle Monuments Commission, 1st Lt. Wilfred D. Potis, U.S. Army Air Forces, serial No. O1300378, served in the 706th Bomber Squadron, 446th Bomber Group, Heavy. He entered the service from New Jersey, and died on April 26, 1945. Potis is buried at Plot F, Row 7, Grave 127, Cambridge American Cemetery, Cambridge, England. He was awarded the Air Medal with 4 Oak Leaf Clusters. When 2nd Lt. Wilfred D. Potis received his silver pilot's wings at the April 15 graduation at Pampa (Tex.) Army air field, they were first pinned on by his wife, the former Dorothy N. Fairchild, daughter of Mr. and Mrs. Charles Fairchild of 630 William Street, East Orange. The son of Mrs. Charlotte H. Potis of 64 Hornblower avenue, he is a 1936 graduate of the high school and was associated for two years before his entrance into the Army three years ago with the Firestone Tire & Rubber company at Akron. He served in Hawaii from a week before Pearl Harbor until July 1942, when he returned to gain his commission in the infantry at Fort Benning, Ga.
His brother Kenneth, 17, attended Casey Jones school of aeronautics and is currently working as an air mechanic at the Rome (N.Y.) Army air base "sweating out" his eighteenth birthday when he can get into the Army. Thank you for your site. My uncle is Wilfred Potis. His brother, Kenneth A. Potis, is my father. You have an error in your information. Wilfred and Ken's mother was Charlotte H. Potis. She was my grandmother and I knew her well. We were very close. She would be very happy to see her dear son Wilfred remembered in the modern age of computers.